The scene couldn’t be more perfect for a wedding. A couple heads out into the mountains where they had their first date ten years before to elope in a quiet, romantic ceremony. Two feet of freshly fallen snow covers the ground making the bride look like a snow angel. And every moment is captured by an expert videographer who happens to be a Siberian Husky. The Burnette family put their dog, Ryder, in charge of taking video of their special occasion with a GoPro camera, and the result is a beautiful, touching scene of excitement, happiness, and family. 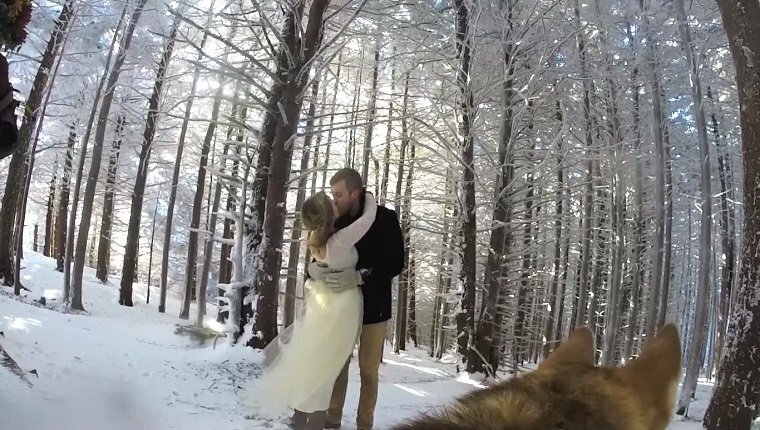 The pooch wanders around, capturing the bride getting her dress ready, dashing through the snowy Tennessee woods, sitting by while her owners tie the knot, and sniffing around the kids and family members at the reception. It really shows what a family event is like from a dog’s perspective. Even though Ryder might not understand exactly what’s going on, you can feel her excitement and joy with every scene. We hope she’s able to film a lot more future events. Was your dog a part of your wedding or family event? Let us know in the comments below!